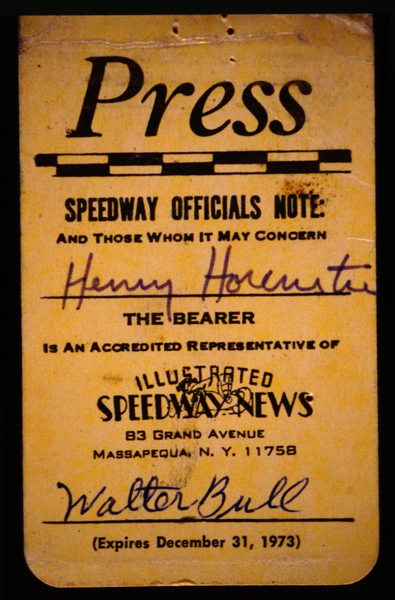 As a young photographer, I was hired as a photographer for the Thompson Speedway in Connecticut. That was in 1972. Every Friday I drove down from my home in Boston and spent days and nights taking pictures of the drivers, cars, races, and fans, for publication in the race program the following week. I saw the job as a chance to make money that summer. But I also saw it as a opportunity for my personal photography—to document a sport I loved and a culture that fascinated me. This was early on in my studies of photography at Rhode Island School of Design, which I attended after several years of studying history. For my personal work, I was simply taking the advice of my former history teacher E.P. Thompson, who preached that a good historian recorded the lives of people who would otherwise go unrecorded and eventually disappear. Now that I was becoming a “historian with a camera,” that’s exactly what I wanted to do. More than 40 years later, the Thompson Speedway still exists and so do its drivers, cars, races, and fans. But all of this and the culture it represents have undergone great changes. You can see it in the styles of dress and hair and so much more. My photographic heroes were the great chroniclers of urban life and culture, Brassai and Weegee. In Speedway, I wanted to do what they did—to show us a slice now of what the world looked like then—here, the Seventies, dutifully recorded and preserved.